DANG, Dec 3: After the district leadership of the CPN (Maoist Center) fielded rebel candidates against the left alliance candidates, the alliance is facing a tough challenge in the communist stronghold Salyan in the upcoming election. 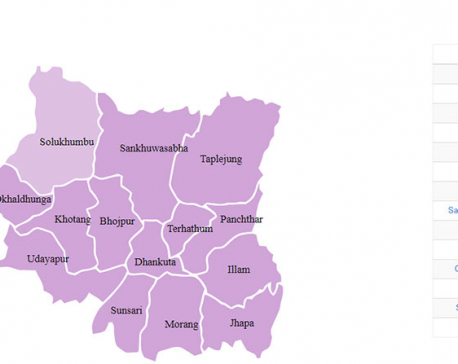 A three-way race between the left alliance candidates, the rebel candidates and the Nepali Congress candidates is expected in the district, as most of the district level leaders of the Maoists are supporting the rebel candidates. Local leaders were irked after the Maoist party decided to allocate both provincial assembly constituencies to the candidates of the alliance partner CPN-UML in the district, irrespective of the Maoist stronghold in provincial constituency-A. The district committee decided to field rebel candidates in both provincial and parliamentary constituencies, with the party leadership turning down their request not to field two-time lawmaker Tek Bahadur Basnet as the candidate for the central parliament yet again. Disgruntled district-level leaders of the Maoist Center fielded veteran Maoist leader Umakanta Sharma for the central parliament, Bhim Prakash Sharma from provincial constituency-A and Jeet Bahadur Pun from constituency-B. District coordinator of the Maoist party, Karna Bahadur Budhathoki claimed that their rebellion is against the monopoly of the top party leadership. “The Maoist leadership made injustice to Salyani leaders who went through a hard struggle and plights for being Maoists during the insurgency. Our rebellion is against their monopoly,” he said. Following an intense exercise, the left alliance succeeded in convincing rebel candidate Pun to withdraw his candidacy from constituency B, from where UML politburo member Prakash Jwala is contesting for the polls as the left alliance candidate. But Pun announced that he will still support rebel candidates in the district. But rebel candidate Sharma of constituency 'A' still claims that the withdrawal of Pun will not help the left alliance. With the district committee coordinator Budhathoki taking the side of the rebel candidates, the Maoist central leadership formed an ad-hoc district committee under the leadership of Nim Bahadur KC. But majority of district committee decided to take action against KC and declared the party's authorized candidate Basnet as the rebel candidate. “We are the authorized district committee and Basnet is our rebel candidate,” Budhathoki said. As the party leadership failed to manage the disgruntled leaders in the district, winning election in the party stronghold Salyan has become challenging for the left alliance. The party has made a clean sweep victory in Baghchaur Municipality of the district and had secured outstanding votes in the district irrespective of the NC-UML alliance in many local units. While the rebel candidates are claiming that the party's supporters will vote for them, the left alliance's official candidates are assured of receiving the party's votes. “The rebel team is unlikely to get the alliance's votes as the party has already expelled them,” said the Maoist leaders. While the left alliance is struggling to manage internal disputes, NC's candidate for central parliament Rajendra Bahadur Shah and Ekraj Dangi of provincial assembly constituency A and Dilliraj Regmi of constituency B have intensified their efforts to make the election results in their favor.